Sharon K. Barger, 74, Kokomo, passed away Sunday, August 5, 2018, at Lakeland Medical Center in St. Joseph, MI. She was born November 24, 1943, in Cadillac, MI. She was the daughter of the late Chester & Dorothy (Danhoff) Knudsen. On June 1, 1963, she married John E. Barger in Kokomo, and he survives. Sharon was a 1962 graduate of Kokomo High School. She was a homemaker who enjoyed camping, surfing the internet, traveling, and visiting with family and friends at the lake. 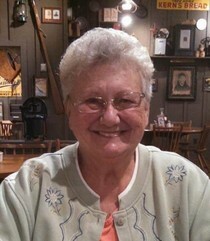 Along with her husband, John, Sharon is survived by her daughter, Christine Barger Rowe, and husband Brad; grandchildren, Jonathon Barger, Deanna Barger, Patrick Walker, Christy Barker, Brittany Cournoyer, and Haley Cournoyer, along with several great-grandchildren; and sister, Linda Culver. Sharon was preceded in death by her parents; and son, John Robert Barger. Funeral services will be held at 2:00 pm Friday, August 10, 2018, at Shirley & Stout Funeral Home & Crematory, 1315 West Lincoln Road, Kokomo, with Pastor Ken Cline officiating. Burial will follow in New London Cemetery. Friends are invited to visit with the family from 12-2 pm Friday at the funeral home. Memorial contributions may be made in Sharon’s memory to the Kokomo Humane Society. Messages of condolence may be left online at www.shirleyandstout.com.